When things get tough (as they are for her today) we say, "I have one wing holding you tightly around your waist and I'm flapping my wing extra hard for you right now." 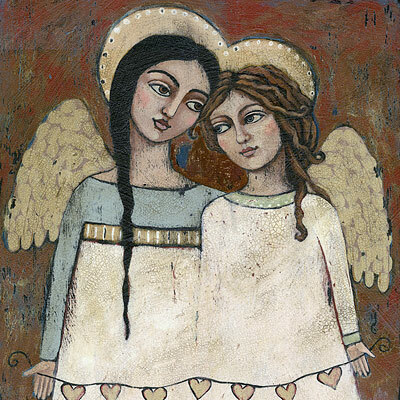 I wondered if you have a painting of two angels like this with brown hair - one with hazel eyes and one with blue eyes? I know you probably don't, but it never hurts to check right?" Wouldn't you just know it, one of the angels had blue eyes and one had hazel eyes! To be honest, I had never heard the Luciano de Crenscenzo quote before but it was just perfect for those two friends and for my new painting. I sent an image of the painting to her and she cried. Needless to say she bought two prints mounted on cradled board with the quote added for her friend and for herself.